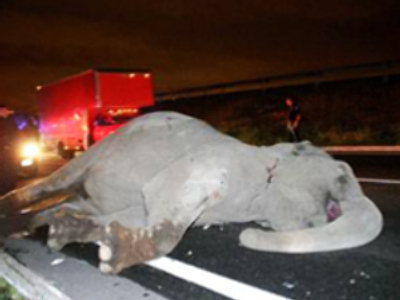 A young female elephant broke through the circus gates and ran onto a busy highway not far from Mexico City’s Teotihuacán pyramids and was fatally hit by a bus. The driver of the bus also died following the crash, some passengers were also injured. Police said the bus had no chance of avoiding the elephant. According to a circus worker, the 5-tonne animal had never shown signs of hostile behaviour before, but managed to escape, while untied for feeding in the early hours of Tuesday. The elephant, named Hilda was 40.